This spring, two garden beds that border the events lawn were replanted based on a design by landscape architect Dennis Buettner. Potentilla cultivars were replaced with flowering perennials and shrubs that add color and visual interest to the area throughout the growing season. 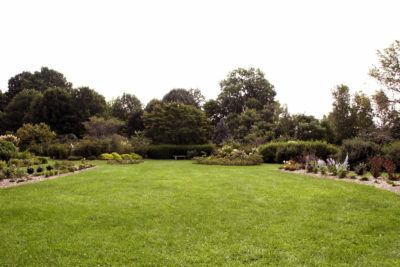 As the shrubs fill in, the lawn area will feel more secluded and intimate, enhancing the area where weddings take place. Seventy new specimens, comprising 50 different taxa, have been added to the gardens this year. One notable addition is a grafted butternut in the collection’s far southeast corner. Butternut (Juglans cinerea), sometimes referred to as white walnut, is a native Wisconsin tree prized for its nuts and quality lumber. The species is found throughout the state, except in the three northernmost counties, but has declined steadily since butternut canker disease (Ophiognomonia clavigignenti-juglandacearum) was first reported in 1967. Trees infected with the fungus develop branch and stem cankers that eventually girdle and kill them. The butternut planted in the gardens was grafted from a canker-free tree growing near Whitewater that was discovered by DNR researchers in the early 1990s. Black walnut (Juglans nigra), a close butternut relative, is resistant to the disease and was used for the rootstock. In mid-June and again in mid-August, heavy rains caused significant flooding of low-lying areas in the Gardens southeast section, where standing water persisted for more than two weeks. While the area has flooded before, this was a growing-season record. 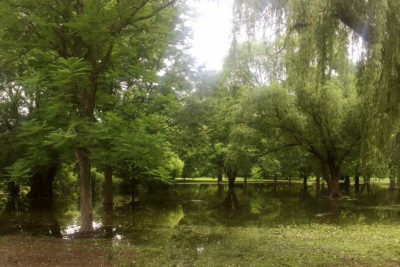 A number of specimens in the area were adversely affected by the water, with four dying. To mitigate future damage, a drainage culvert will be re-established. On July 21, we hosted 140 conifer aficionados in the Gardens’ for the American Conifer Society’s central region conference. LHG curator David Stevens and Laura Jull, associate professor of horticulture at UW–Madison, gave attendees a tour of the pinetum and highlighted a number of unique specimens in the collection. Two hardworking and good-natured students assisted staff in LHG and the natural areas this summer. 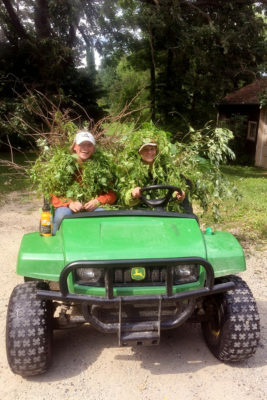 Dana Janusz, from Oswego, Illinois, is a junior at UW–Stevens Point majoring in Forest Ecosystem Restoration and Management with a minor in Water Resources. Margaret Johnson is a sophomore at UW–Madison, double majoring in Environmental Studies and English. She is from Sun Prairie, Wisconsin. They were undeterred by clouds of mosquitoes and played a big part in maintaining the health and beauty of the Gardens. Both students valued their time here and have greater knowledge and appreciation for woody plants and their diversity.